Nick Watts reviews a new book looking at the politics of green trabsformations. It is now abundantly clear to all but the most deluded or duplicitous of observers that our resource-intensive economic growth model is unsustainable. Over-consumption is widely recognised as being detrimental to the climate and environment, leading to calls for ‘green transformations’. But how do we define green, who needs to act, what do we need to transform, and at what pace? By answering these questions – amongst others – the editors of The Politics of Green Transformations, predominantly academics working at the University of Sussex, seek to demonstrate the inherently political nature of green transformations, and the unavoidable trade-offs and competing interests that inevitably shape any proposed reforms. The book provides much-needed clarity and context to a debate that is so often muddied by ideological positions that obscure and obfuscate tangible reform pathways. The book ultimately prescribes a holistic approach to green transformations. The idea that we can wait for technology and market forces to save us from certain disaster is a fallacy, the editors argue; the state must play a more substantial role, driving both the debate and practical transformative initiatives, such as financing projects that may otherwise struggle to secure private funding. The book also argues that grassroots organisations must play a much greater role, despite the difficulties they will face confronting entrenched policy discourses. Examining transformations that have been implemented in various countries across numerous industries aids understanding as to why some initiatives have been more successful and how they could be emulated elsewhere. The Politics of Green Transformations is a textbook straddling the genres of academic and popular science/politics. As such, it can be a little convoluted at times, depending on the style of the editor(s) in question, and some chapters are more readable and engaging than others. Each chapter explores a particular facet of the debate, meaning that they can be read individually or as a whole. 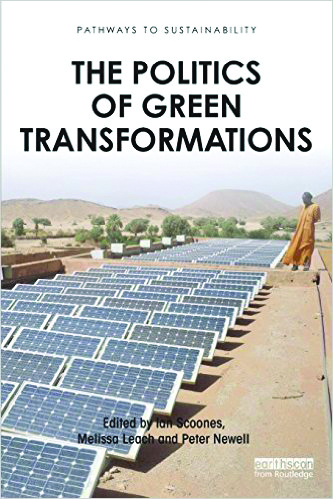 However, the book works best completed in its entirety to ensure a full appreciation of the complex relationship between the politics and policies underpinning the green transformation movement, the challenges posed by unsustainable lifestyles and economic models, and the multifaceted solutions needed from the top-down and the bottom-up.